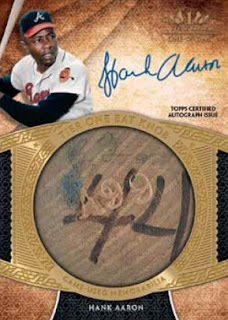 2017 Topps Tier One Baseball arrives Friday at Sports Cards Plus, with a High End Product checklist that’s strictly autographs and memorabilia cards. Hobby-exclusive 2017 Topps Tier One Baseball boxes have three cards. Two are signed and one’s a relic. Randomly inserted hot boxes also appear with an extra memorabilia card. 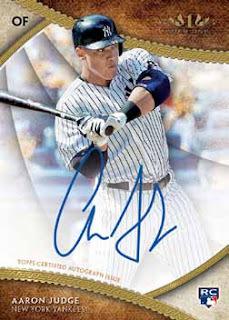 Sticking with the brand’s tradition, virtually every autograph in 2017 Topps Tier One Baseball has an on-card signature. A couple of exceptions exist with autographed relics, but not many. Even most of those are hard-signed. As far as signed cards go, Breakout Autographs and Prime Performers Autographs are the among the largest parts of the checklist. Each has over 75 players. Breakout Autographs spotlights rookies and young players while Prime Performers cover a variety of eras. Blue ink represents base with parallels levels in Copper (/25), Silver (/10) and Gold Ink (1/1). Clear One Autographs have a different look from the rest of the product. Numbered to 5, these cards are printed on plastic card stock. Tier One Autographs are considered case hits. 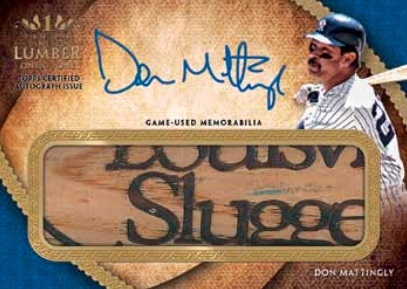 Top veterans and retired players are featured on this part of the checklist with serial-numbered base versions coming with blue ink. Parallels are also available in Copper Ink (/25), Silver Ink (/10) and Gold Ink (1/1). Tough Dual and Triple Autographs are also available. Despite the multiple signers, they’re still hard-signed. Cut Signatures (1/1) and Cut Signature Relics (1/1) are also randomly inserted. 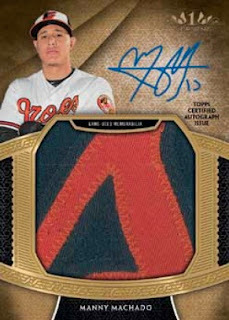 Autographed Tier One Relics have a definite Triple Threads vibe to them. As far as signed memorabilia cards go, they’re fairly basic. This is one of the places in 2017 Topps Tier One Baseball with stickers. In addition to numbered base copies, there are Dual Patch (/25) and Triple Patch (1/1) parallels. Dual Autographed Tier One Relic book cards (/10) have autographs and swatches from two players. Dual Patches (1/1) are the only parallels for these. Those pen cards return for a second year. Signature Tools Autograph Relics (1/1) have a piece of the pen used during the signing. Tier One Relics and Legends Relics are standard uniform and bat cards. All come numbered including Dual (/25) and Triple (1/1) Relic parallels. Prodigious Patches (/10) return with some massive patches. Platinum versions are one-of-ones. Autographed versions, which are also numbered to 10, are hard-signed directly on the card. Premium bat pieces have long been a defining feature of Tier One. That continues in 2017 with Tier One Bat Knobs and Limited Lumber. Knobs come with the ends of game-used bats while Limited Lumber uses distinct parts like the company logo on the barrel or the player’s name. These are all one-of-ones. Both have signed versions as well, also numbered to 1. 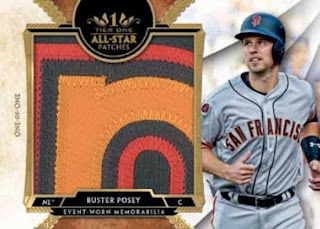 Finally, there’s Tier One All-Star Patches (1/1). These come with jumbo swatches from an All-Star workout jersey.